We had a wonderful day yesterday – an impromptu visit to Abersoch, one of our favourite places in the world. We couldn’t fit in a night away but decided to go for it and do the 2.5 hour journey and back in one day. With LOTS of stops and a Huuuuge picnic. 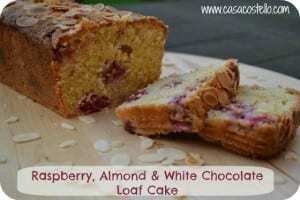 Of course, no picnic is complete without a slab of cake so on Saturday morning I got out the Loaf tin and made a Raspberry, White Chocolate and Almond Loaf. I believe you must do rustic for a true picnic so there was no decoration and just a few fingers crossed that the raspberries didn’t all sink to the bottom (They didn’t!) I rolled the raspberries in the flour and ground almond mixture before adding to the cake mixture. If I could recommend one tin to have in your cake tin collection, it would be a loaf tin. You need a really sturdy one but it will be used time and time again. And they are much easier to cut into portions that a round cake. I love extra almond flavour so am liberal with the almond extract – you might want to tone it down a bit if you are not as obsessed as me. Preheat the oven to 180C and line a Loaf Tin - I have Loaf tin liners which save oodles of time. Add the milk and half of the flour alternately - it may look a little curdled but will still work out. Add the lemon zest and the Almond Extract, mixing on slow speed. Cook on 180C for 30 mins then reduce the heat to 160C and cook for a further 15-25 minutes. A skewer should come out clear - the outside will be darker than the inner cake. Make sure you are not skewering through a piece of white chocolate. 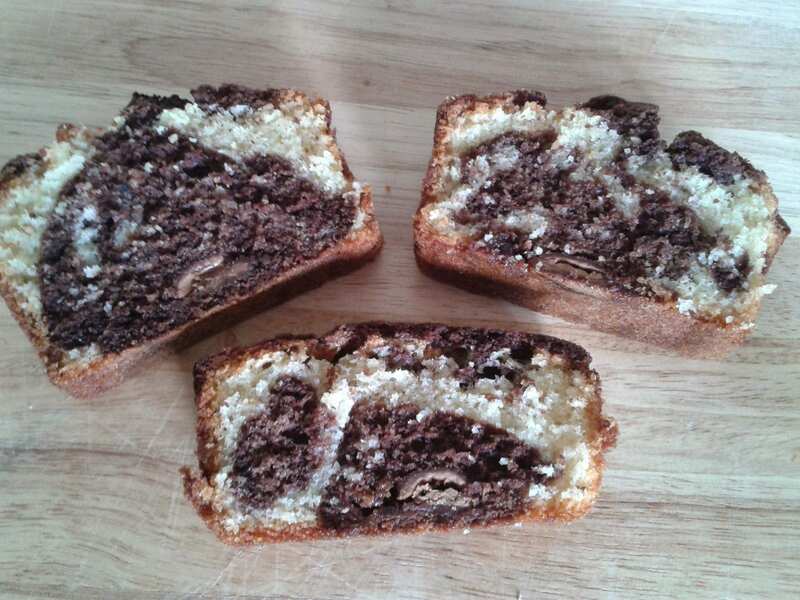 I’m going to be showcasing a lot of loaf cake recipe over the next few weeks – Honest answer, I need somewhere to keep them and here’s as good a place as any! 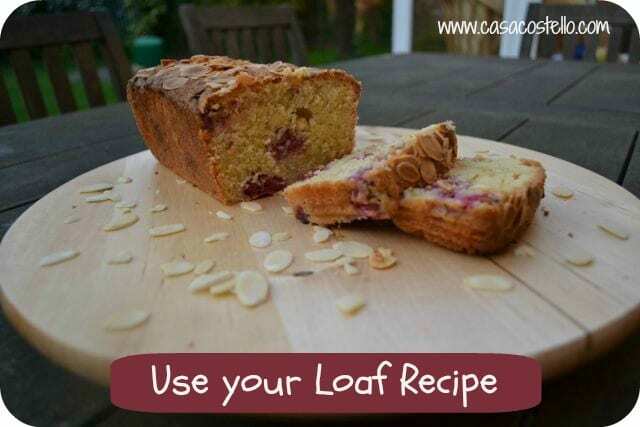 If you would like to link any of your favourite loaf cake recipes too, please shout and we can keep them safe all in one place. 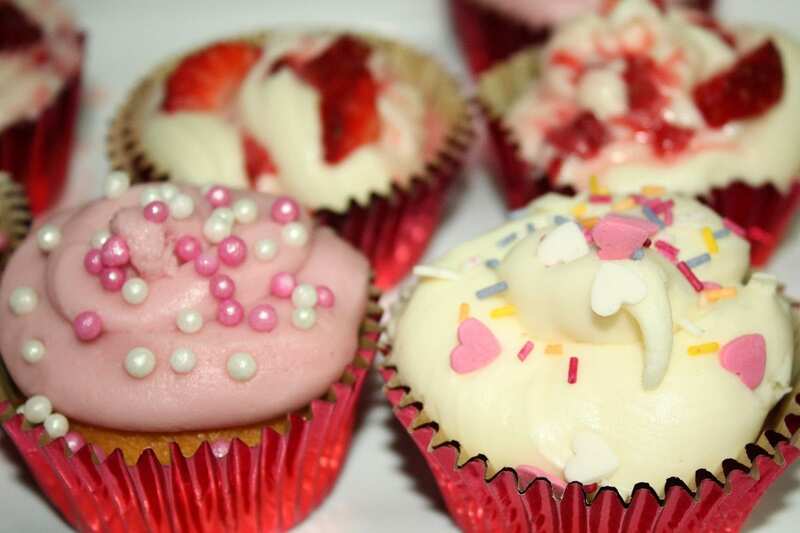 Lovely to see that Bake of the Week is getting regular contributors – Lets spread the word this week and get some of our fellow bakers joining in. Kirsty from Hijacked by Twins gave us a wonderful Chocolate Marble Cake – I always forget how fascinated kids are by the effect of marble. Must bake one with them very soon. – I’m hoping Kirsty links up her Easter Hot Cross Buns this week! The linky is now open to join in with this week’s #Bakeoftheweek – Don’t forget to add the badge below to your post to let others know you have entered. Entries close next Monday – Let’s see lots of Easter bakes this week! Thanks Jenny. It did smell great but Mr C has just devoured the last of it. I also love loaf cakes for freezing as they are so neat and compact. Love raspberries and this looks gorgeous. Like you, agree a loaf tin is indispensible. When we moved house and were staying in rented cottage with not much space, it was the loaf tin that I used the most and which came to my rescue endless times! #TastyTuesday (will be back for the bake of the week). Thanks Sarah – I do intend on trying this recipe with frozen raspberries too so it can be made all year round. Am sure it would work. Can’t ever have too much almond taste for me! I’ve a feeling this might be baked again this weekend judging by the hints! They look gorgeous, Kirsty – Thanks for linking up again. Your loaf cake looks utterly delicious. I love the flavours you have used. I’m in agreement with you about loaf cakes, I use my loaf tin quite a lot. I shall be book marking this recipe, as it sounds fab. I am odd in hating almonds? otherwise sounds yummy! Why do you put 200g flour if you’re only going to use half of it? I realise the raspberries are supposed to be ‘dunked’ in the flour and almonds. I also don’t really get that as the dry ingredients don’t stick to the raspberries?